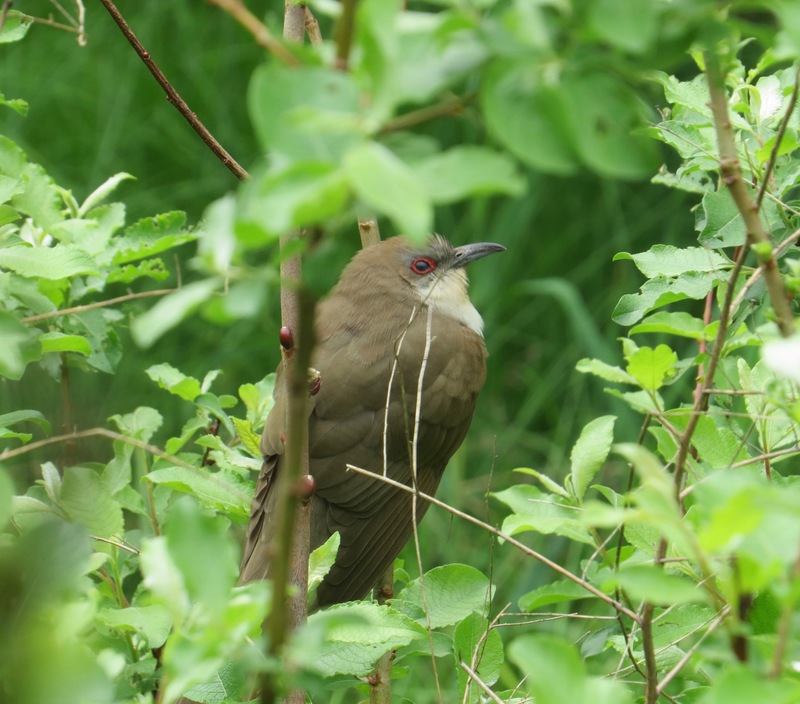 The Black-billed Cuckoo is relatively elusive, which is surprising for such a long-tailed creature. “Sluggish and secretive” says Cornell’s All About Birds about Coccyzus erythropthalmus. I was surprised on Friday when a popped into eye-level view at Brooklyn Bridge Park. I see the Yellow-billed (C. americanus) more often — and that isn’t that often. Both species are great devourers of caterpillars and tend to congregate around outbreaks of tent, fall webworm, and Gypsy moth caterpillars. The Black-billed’s specific epithet erythropthalmus means “red eye,” although, of course it’s not the eye itself that is red but the lining. But why “cuckoo”? “Coccyzus” refers to the famous Cuckoo (Cuculus canorus), but our New World birds are unrelated to the Old World one. They also aren’t brood parasites like that Cuckoo so famously is. That Cuckoo lays its eggs in the nests of other bird species, like our Brown-headed Cowbird, and gave us everything from “cuckoldry” to metaphors of humans being the animal that doesn’t make its own nest (Thoreau, Holmes). But evidently the cuckoos of the Americas were thought to sound a little like the Cuckoo… which really does sound like a cuckoo clock. The name imitates the bird’s sound so well that it’s found in classical Greek (kokkux), modern Greek (kukkus), Latin (cuculus), Italian (cuculo) French (coucou), German (kuckuck), Swedish (gök)… and, taking us down the Indo-European road, Sanskrit (kokila). Our cuckoos are declining, due to our chemical/neurological war on life. In the UK, theirs are disappearing; ditto.